A fruity dessert to tickle those tastebuds! Quick and easy to prepare, a perfect end to any meal. Firstly crush the strawberries in a bowl, using a hand blender to achieve best results. Pour the cream into a glass bowl and add the sugar and strawberries, whisk until the mixture is beginning to thicken. Add the vodka (if using) and whisk again, until soft peaks are formed. In a separate spotlessly clean bowl whisk the egg whites until forming soft peaks. 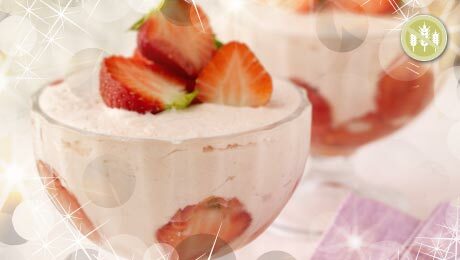 Fold the egg whites into the strawberry mixture and spoon into glasses or ramekins and place in the freezer for up to 1 hour.